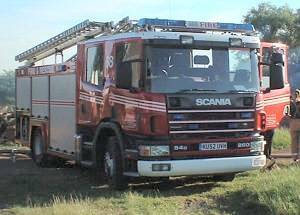 The VORD Garage is threatened by a fire which had become out of control in the adjacent farm yard. A bonfire had spread to a pile of chippings, and had jumped to a few hundred tonnes of dry wood beside the VORD Garage. 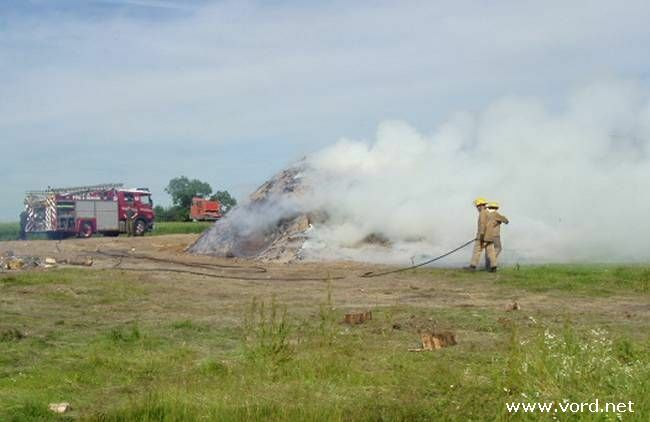 A bonfire in the adjacent farm yard had been blowing smoke towards the house all morning. Fortunately the smoke died down when the fire got nice and hot. We went to investigate when the fie started smoking again. 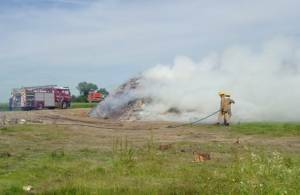 It turned out that an enormous pile of wood chippings had ignited. We called the fire brigade who quickly had the fire under control. 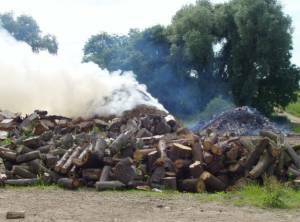 The pile of wood chippings was only a couple of meters from a hundred tonnes of dry wood which had already started burning. Behind that is a very old and dry wooden barn, which backs directly onto the VORD Garage. The MGA was moved out of the garage pretty sharply, but the immobile MGB V8, Robert's Rochdale, and Gary's Alfa could not easily be moved. It was a hot day so the first step was to set up a paddling pool. The fire engine can only cary a small amount of water, and normally relies on there being a fire hydrant nearby. 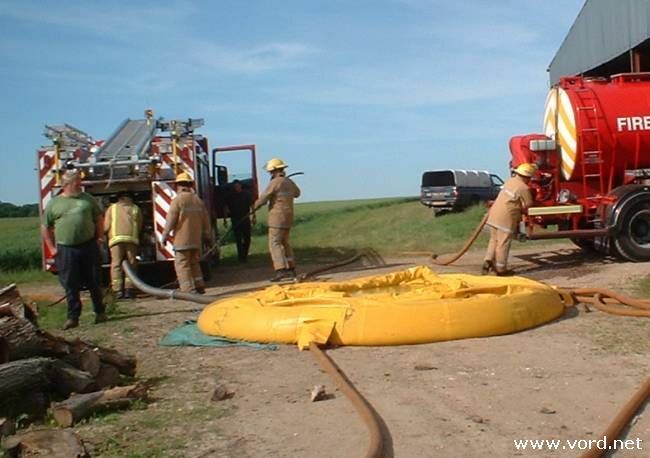 Unfortunately the nearest hydrant was some distance away, so a small water tanker was used to ferry the water from the hydrant to the 'dam'. 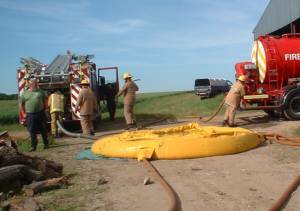 It takes time to ferry water around by road, and there was only sufficient water to control the fire rather than put it out altogether. 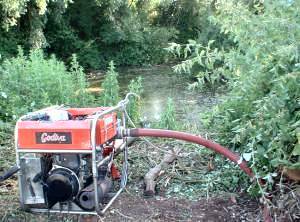 A fire pump was set up to draw water from our pond. This proved to be a much more efficient water supply than the paddling pool, and we could crack on with putting out the fire. A brave fireman fights the blaze. 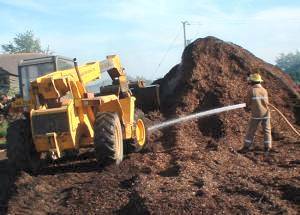 The fire had gone quite deeply into the pile of wood chippings. 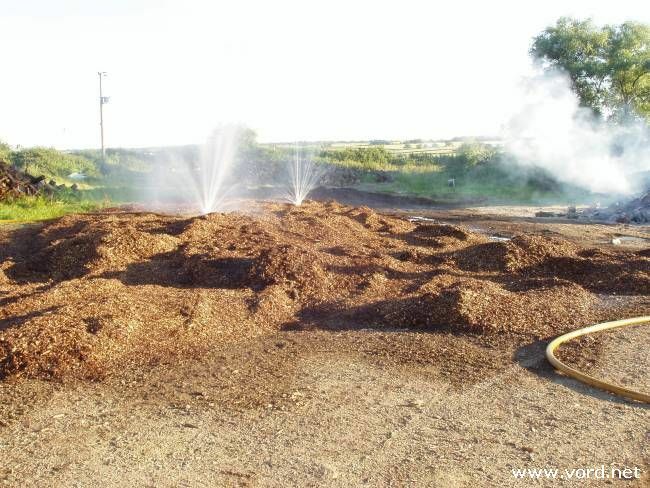 Spraying the chippings with water helped, but the smoldering chippings would quickly start burning again. 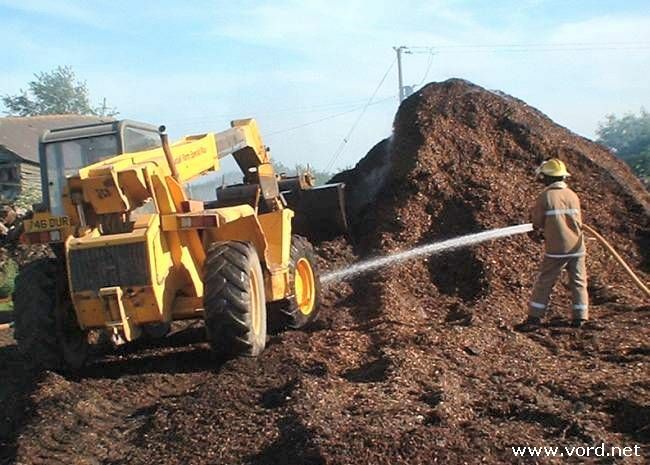 The Loadall was called in to spread out the pile of chippings so that it could be thoroughly soaked. 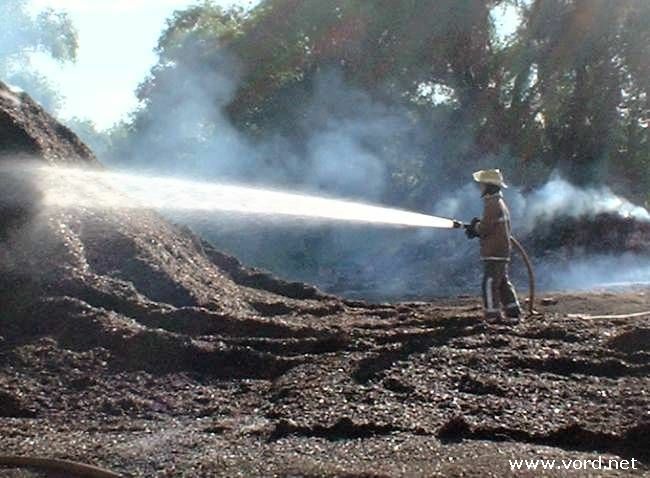 Simon spreads the chippings while a fireman sprays them with water. Two hours later the wood chippings are very flattened, very wet, and no longer burning. A sprinkler system was used to continue wetting out the chippings. The fire was out and was going to stay out. 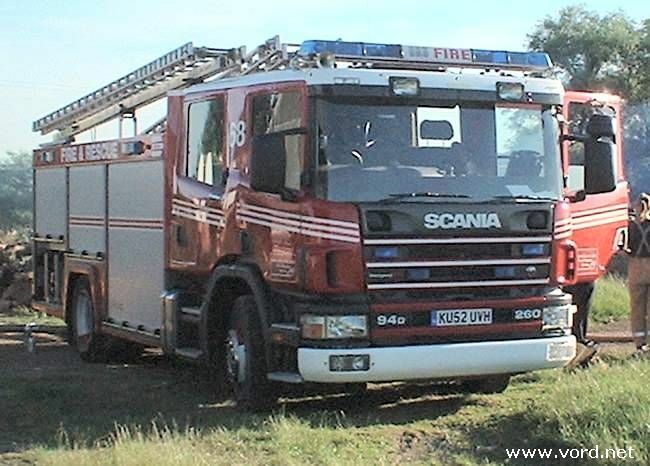 VORD is indebted to the firefighters from the Kempston Fire Station for saving the VORD Garage from certain destruction.